The Zodiac Sign Capricorn Woman (December 22 - January 20), Capricorn Personality Traits for Female born under December Zodiac signs. The Capricorn woman has a very difficult nature to understand, which seems to be mostly directed inward to her own experiences than to the outside world. She always gives the impression of a very busy lady, having some kind of an overwhelming job, too much load on her shoulders, and such a sense of feeling about her arises wherever she appears. Due to this, the Capricorn woman enjoys constant respect from people around as someone who knows more than she says. With age, the Capricorn woman may get rid of some of her inferiority complexes, and become a very attractive lady, sociable and moderately cheerful. Capricorn woman always wants to manage global affairs, she is a maximalist at work and in relationships, and therefore she cannot be interested in casual undermining or in meaningless dating and relationships. She does not want to waste her life on empty talk. And that's why she gets rid of unwanted observers who come to her personal life out of curiosity, thereby not letting them cross the threshold. In some ways, she is closed personality, and carefully guards the calm of her inner world, but that does not mean that she is stiff and cold inside. Only few close friends may know that there is always a burning fire in the heart of a Capricorn woman. She can be romantic, funny, and sentimental, but will never go beyond the redistribution of this closed world, leaving her real life inside herself. It is very difficult to court a Capricorn woman because she has many demands for her future man, and above all appreciates his intelligence, strength and honesty. The Capricorn woman is always very restrained and proud, she will not show that she is being offended by opponents' attacks or feels the admiration of a new companion, but inside her, she is subtle, vulnerable and very sensitive. Misunderstanding by her man can deeply hurt her, and the representative of this zodiacal constellation sheds tears and shows frustration very often in life. Having failed in her personal life, the Capricorn woman with a tripled zeal will take up work and career, she does not really need advancement on the career ladder, as such, but she is able and willing to engage in a career as an activity that diverts her attention from failures in her personal life and heavy thoughts on the matter. The Capricorn woman's partner who does not look into the essence of her personality, will be inclined to think that she is cold and has no feelings, and this is often the main cause of him parting ways with the Capricorn woman. The Capricorn woman is very careful in work and life, she does not make reckless moves and even prefers not to break away from reality during the flight of her thoughts about the future. Despite her apparent strength and independence, Capricorn woman wishes to have a reliable and strong partner who will be a support and protection for her against many life's winds, because deep down she still wants to become weak and tender. This confirms the fact that Capricorn woman who found her beloved man, can easily abandon her ambitious thoughts of a career and devote herself to caring for him and the children. The representative of this zodiacal constellation cannot be completely made a housewife, but she only becomes prettier from a successful personal life, she begins to understand her true purpose in life. In addition, the Capricorn woman gets a defender of her interests in the person of a reliable loving partner, and gets rid of many of her old and outdated inferiority complexes, becoming more open, relaxed and upbeat. The Capricorn woman will be a very good housekeeper, a strict but fair loving mother, she will protect the relationship in the family from devastation and misery, and will be a good helper and adviser in her husband's career. 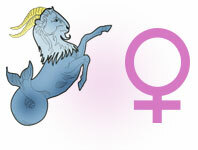 Full description of Capricorn Woman, character traits and personality characteristic for female Capricorn.